RUSH celebrates a huge milestone – the opening of its 80th salon. Dotted all over the country, you are never far from a RUSH Hair & Beauty salon. The first RUSH salon was opened in Wimbledon in 1994. 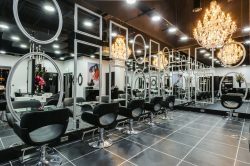 Twenty-two years later and RUSH have just opened the 80th salon and plans to reach 100 salons nationwide. As a potential Franchisee, it is great knowing that you could open your own salon in a city near you. With many more salons opening in 2017, now is a better time than ever to get involved in the RUSH Franchisee programme. With confirmed openings including a flagship store in Manchester. There are plans for many more salons to open this year. RUSH are growing as a brand and getting involved in the Franchise process is easier than ever. Not to mention, since June, RUSH have welcomed new franchisees, employees and opened salons in York, Milton Keynes and Leicester. The business is definitely growing. The brand is keen to travel further afield across the country to new destinations and find new opportunities. RUSH are looking for individuals who fit with the Franchisee criteria. We look for hard working, talented, determined people. Imagine being your own boss in a location that suits you.